This is a commission piece from my Etsy store. 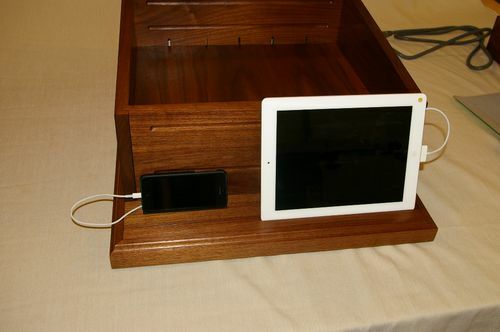 A large docking station with a hidden drawer made of solid walnut and walnut veneer plywood with brass handles. Also included is a small ‘pencil’ box that is removable and portable. 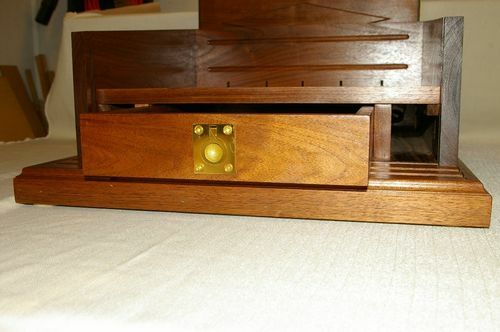 The front of the piece can be removed by releasing the bolt latch underneath and sliding straight up to reveal the hidden drawer. 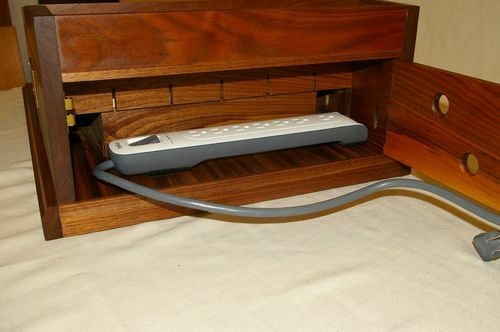 Channels run on either side under the middle tray to allow cords to run to the front for charging. An ‘easel’ completes the front of the piece with two grooves that allow for different viewing angles for different sizes of mobile devices. 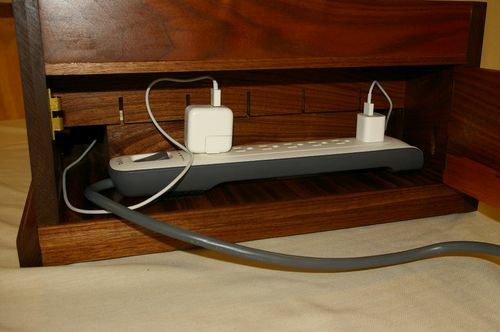 The thought behind this was to have an option to charge multiple devices while concealing most of the charging wires including the power strip that they all plug-in to. The middle-back of the tray also slides up in grooves which allows wires to be changed out easily for devices that will sit in the middle tray. The grooves or slits for the charging wires are wide enough for the wires but narrow enough to where the charging end of the wire does not fall back through the slits. Although it is portable it’s designed more or less to stay put for long periods of time – it is a bit heavy. Went through several weeks and months of back and forth design including a mock-up build from plywood and it was all very much worth it. I love working with walnut. No stain, just three coats of wipe on gloss poly and a generous coating of beeswax and orange oil. WOW thats intense, what a great design. 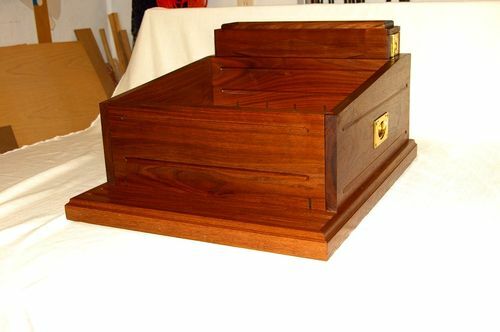 This is what I love about woodworking someone needs something and we just design around that need. To make charging a furniture.